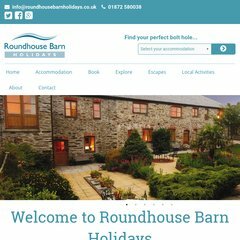 Topics: [jump To Content], Roundhouse Barn Holidays, Roundhouse Barns, Holiday Accommodation, Grounds & Gardens, and Being Green. Its IP Number is 82.165.113.228. ns68.1and1.co.uk, and ns67.1and1.co.uk are its DNS Nameservers. It is hosted by 1 1 Internet Ag Baden-wurttemberg, using nginx web server. PING www. (82.165.113.228) 56(84) bytes of data. Website load time is 1292 milliseconds, slower than 63% of other measured websites. As well, a ping to the server is timed at 115 ms.